This lovely turquoise jean jewelry will certainly looks delightful hooked to the loop of your jeans. It dangles as you walk and is likely to attract lots of attention. The turquoise flowers and gemstones go so well together with the freshwater pearls and sterling silver findings. Click on any image below for gallery or expanded view of this beautiful jean accessory. I found the big clasp while shopping for beads. The first thought that came to my mind when I spotted it was - "Hey! That's what I need to make my turquoise jean jewelry." So I bought a few and will be making more of these jean jewelry with my other gemstones and beads. I like this clasp very much. It clips easily onto the loop of my jeans and once clipped onto the jeans will stay secure. It's also not heavy as it's made of a non-tarnish lightweight metal. 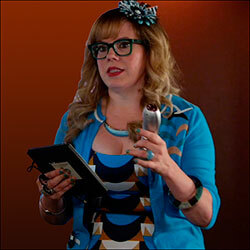 Below is the instructions for making this turquoise jean jewelry. Prepare the big turquoise drop with the big eye pin, silver bead cap and big turquoise stone. Make a beaded drop. 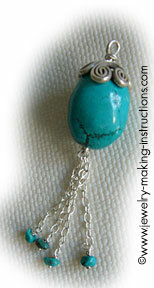 Attach each tiny turquoise drop to the end of the 2 tiny silver chains. Take the centres of the 2 tiny chains and attach to the loop of the big drop with a small silver jump ring. Attach the big drop to the end of the 2 inch silver chain. Begin attaching all the other beaded drops onto the 2 inch silver chain. Finally, attach the chain to the big silver color clasp with the big silver jump ring. And here's the turquoise jewelry clipped onto the loop of my blue jeans. Handbag: You can also use this to beautify your handbags. Just clip it to the zip pull if the hole is big enough. If not, just clip it onto the handle of your bags. Mobile phones: Use a smaller clasp and as your mobile phone's accessory. Key chains: A beautiful accessory to attach to your key chain purse or ring.